The British Travel Awards offer a range of sponsorship options to suit every budget. We can tailor a package for you; whether your goal is to promote your brand to our consumer audience, travel industry decision makers or both. Our flagship package offers maximum exposure of your brand across all our communication channels. Prize giving brand logo and details of holiday prize in generic BTA press advertisements in Reach Solutions national and regional newspapers and online content..
Editorial featuring the sponsor’s prize in the Daily Mirror’s travel section. Minimum of four solus ads inserts (overlaid with BTA call to vote footer) between July and the end of September, with “subject to space” additional inserts throughout the 13 weeks voting cycle. Sponsor can select from: Daily Express, Sunday Express, Daily Mirror, Sunday Mirror, Daily Star, Sunday Star, The People, Scottish Daily Record, Sunday Mail. 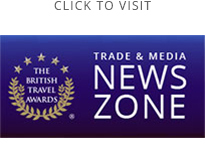 Prize banner on britishtravelawards.com home page header slideshow with link to prize chest page displaying image and full prize details. Entry of the sponsor’s brand in up to five categories on the British Travel Awards 2019 voting form. Use of official “Partner” logo (same style as nominee logo) and voting buttons with link to direct voting app. Inclusion in “call to vote” press releases prepared by BTA media relations in consultation with sponsor’s designated contact. Sidebar or banner ad on the BTA website until 31st March 2020. Inclusion of sponsor’s news/blog or video content in BTA Connect our weekly online paper. (Subject to compatible encoding of the sponsor’s webpage). Inclusion in trade press releases, circulated to trade media and distributed by TravelMole and to our travel industry database. Email Q&A interview with sponsor to discuss involvement with the BTAs and profile their brand; to be included in dedicated “Partner Edition” to all TravelMole subscribers. One premium position table of ten at the awards night on 27th November 2019 (value £3,000 plus VAT). Option for sponsor to present on-stage awards group and make short introduction about their brand. Multiple, one metre square stage LEDs display the sponsor’s logo during the awards presentation cycle. Event programme includes full page sponsor’s message, logo and presenters photograph next to their awards presentation. Sponsor supplied mute video/ad shown on venue display screens during the dinner interval. Sponsor’s logo prominently featured on all digital and printed collateral at the event and networking opportunities with 1,000 senior travel industry and consumer media guests. Inclusion in the Daily Mirror’s travel section - listing the 2019 winners - on Saturday 30th November. Sponsor’s rolling credits logo, and ad together with links remains on the BTA post-awards website until 30th March 2020. Updated website content includes: categories, award winners, polling analysis, sponsors, awards night review, and voters prize draw winners.